From fun to fretting and everything in between. Which Uni is Right for Me? Which Degree Should I Study?! £1 Back To School/Uni PoundWorld Haul! Is The Loch Ness Monster Real? Fidget Spinners: Worth The Hype? Mystery Monday | What Happened to Madeleine McCann? If you’ve never tried Biscoff biscuits before, you’re seriously missing out. A sweet, crunchy biscuit, with a caramelised taste, they’re perfect for dunking in your tea or coffee. Mmm. However, recently I discovered an even better way to enjoy them, thanks to a recipe from Three Brits. 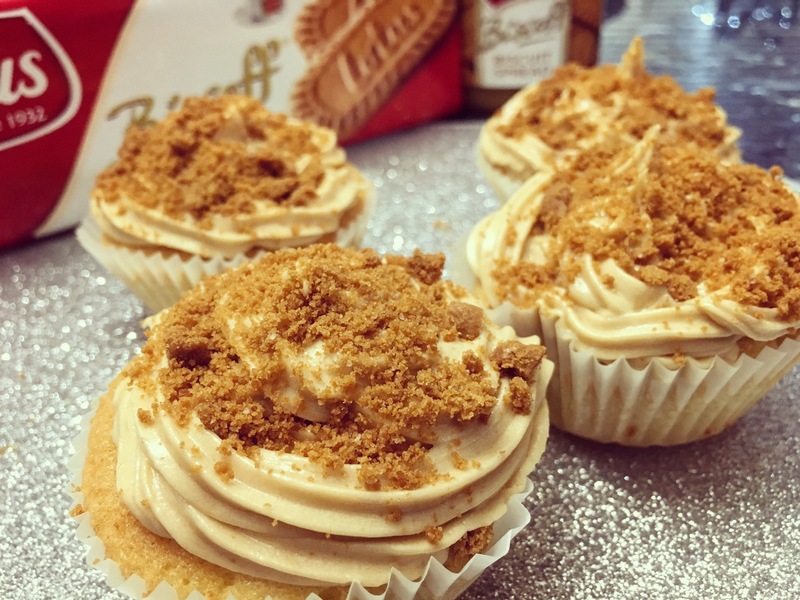 As someone with a really strong sweet tooth, the sound of Biscoff Cupcakes sounded incredible! And, it certainly didn’t fail to disappoint. So, I thought that it would be a good idea to share their recipe with you, as I know you’ll love it. This recipe makes 12 cupcakes, but if you want to make more/less just adapt the quantities to fit. It’s also super easy, so don’t worry if you’re not a pro in the kitchen! Pre-heat the oven to 180C. Cream butter and sugar together in a mixing bowl until light and fluffy. Add the eggs and mix. Sieve the flour and baking powder into the mixture and stir. Spoon the mixture equally into the cupcake cases. TIP: Fill each case halfway then go back and add more, to make sure all of your cupcakes are the same size! Place in the oven for 12 minutes. TIP: Place a cocktail stick/the end of a knife gently into one of the cupcakes to check it’s fully cooked. If you can see some moisture when doing this, they aren’t ready yet. So, pop them back in and try again in a few minutes. While you wait for your cupcakes to cool, mix together all of your ingredients for the icing, making sure that you have a smooth texture that retains some stiffness but will be able to squeeze through a piping bag! Pour the icing into a piping bag and pipe onto your cool cupcakes. Pop your biscuits into a food mixer, until they’re completely crumbled. Or, use a rolling pin to get the same effect. Then, sprinkle on top of your icing. If you loved those, then you’ll also love these other recipes that I’ve found: a large Biscoff cake, and Fudgy Biscoff Brownies. Over the next few weeks I’ll hopefully be giving these a try for myself, so I’ll keep you updated. But, I’m sure they’re just as yummy! Don’t forget to follow, with a new post every day at 6pm during the week, and 1pm on a weekend! You honestly have to try them, they are sooo delicious! Ooo they sound amazing, I’ll have to try those! Me neither, I think I’m obsessed! You have to try them, they are SO good! I’ll take a look at your group! Joined! And I’ll post my recipe tomorrow when I get a chance! Oh my 😍 Sounds delish! Although I’ve never had the pleasure of trying a Biscoff biscuit 😥 I’m sure I’m missing out. You are missing out!!! You need to try them, they are so good! I’m sure they are! As I live in the US, however, I’ve never seen any sold here. 😦 I’d love to try one! Omg they look so yummy! I love having a biscoff with a cup of coffee. Will keep this recipe in mind, I love making cupcakes! What a creative idea, something I haven’t seen before in the cupcake world which is rare. Will have to try for sure! It’s delicious – definitely give it a go! And thanks for reading! Omg these look amazing these are my favourite biscuits so I will have to give this recipe a go! They’re so tasty aren’t they?! I would definitely suggest trying them, I’d probably go as far to say they’re even tastier than the biscuits themselves! I can taste it with my coffee right now. I can’t wait to try them! First attempt at a drip cake! Had my nails like this for ages but keep forgetting to post this photo! Love the pearl effect!